Those who have reached this page from search engine must be knowing that Tirupati Balaji is a very famous temple in south India. I'm saying this because most of those visitors reached this page by searching "Balaji Temple Pune". You have reached the right place to see the very beautiful Balaji Temple Pune. For my blogger friends, this might be a new information that Balaji is one of the highly believed in GOD, in India. There is a huge temple in south India. Considering the faith of people, many replicas have been created all over India. One replica is near my city Pune. Balaji Temple Pune is very clean and beautiful. See the below photo to know for yourself. Balaji Temple Pune is very decorative, with amazing carvings, beautifully painted walls & ceilings and breathtaking views of many gods and goddesses. Sadly, photography is not allowed inside the temple. So I could not take and show you the photos from inside. But the view from outside is equally worth. See below. What do you say? If you are visiting my blog for a long time, you might have noted that I had published 2 photos of this temple last October. 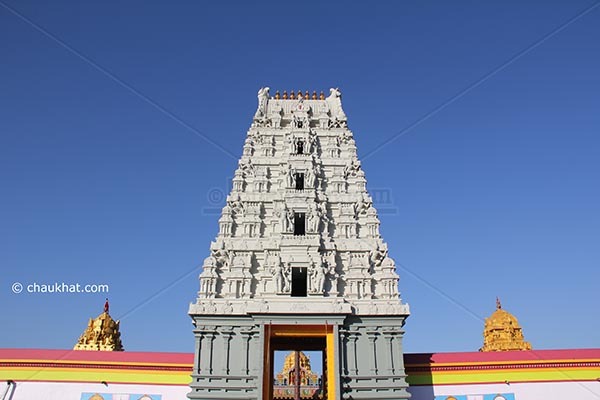 See Balaji Temple Replica in Pune. Those photos were loved very much. But it was time to take even better photos. I took many new photos of Balaji Temple Pune 2 days back, on Sunday. Early morning of winter gave amazing colors and my Canon T2i did a great job of recording perfect Booleans creating this beautiful electronic painting! A beautiful shot...the colors have come out perfectly! Beautiful photo and beautiful place! The route to Balaji temple in PUNE is not clearly listed anywhere. I visited Balaji temple last week 7th May 2011. Distance from Vashi to Pune Balaji is 177km. There is no clear indication of road or temple in this road. Once you are in New Expressway, drive straight proceeding towards Satara road. After Pune exit bypass road it is approximately 40kms. The temple road appears on your left. there will be lot of chaos on that road as it is busy junction. Village name is Ketkawale. From that Junction take left and drive 3KM. parking is available near temple. You can park, keep your shoes in rack, wash your feet then proceed. Near Shoe rack counter there is Kalyanakatta wherein you can get tonsure done. Not a single paisa has to be paid anywhere. Everything is free. Darshan will take max 15mins. It is generally not crowded. Kindly collect food coupon in the temple after darshan. Food is simple like plain rice and some type of Sambhar & Rasam combination with red chutney. They do offer multiple servings. For Sr citizen Dining table is available. Wheel chair is also available. During Summer the entire stretch is very hot since it is stone based path. Carry your children upon your shoulder to avoid foot burning. @ Anonymous: Thank you so much for your valuable contribution on this page. I really appreciate it. I have visited the temple a few times by now. But something interesting happened yesterday. I saw a guy (fair complexioned, hazel eyes and in grey shirt with folded sleeves) looking at me a few times. If by any chance that guy is reading this, then revert back to me. Else kindly do not reply!! Thanks. Are you planning to make it? :) Did you find that guy by the way? Lol no, I won't do that. Your blog was the first to show up when I googled 'Balaji Temple Pune'. That pretty much explains why my post is here. And no, I haven't found him yet. Like you can see there's no reply from him. I was just kidding with that dating site line :) Anyway, I hope that he too will make a search and will land on this page, and will read your comments, and will reply, and you two will go for a real date. It's very considerate of you to say that. Thanks! My pleasure; best of luck to you! Thank you for your valuable notes Kavin Ka!